Having his best season, the veteran has filled the leadership void left by Brook Lopez. OAKLAND, Calif. — A year ago, it was Brook Lopez who played the elder statesman role for the Nets and tried to shepherd his young teammates through a disastrous 1-27 midseason stretch. But since Lopez was traded away last summer, the role of mentor has fallen to nine-year veteran DeMarre Carroll, who is having the best season of his career and is setting a great example for a team in a 2-15 tailspin. Carroll’s leadership figured to be tested again when the Nets faced the defending NBA champion Warriors Tuesday night at Oracle Arena. “I think the biggest thing is just trying to keep everybody in good spirits,” Carroll said following the morning shootaround. “We’re losing a lot of close games at the end. It comes down to one or two plays. The Nets (20-44) lost the first three games of this trip in excruciating fashion, with each decided in the final minute of regulation or in overtime. It takes a mental toll, but Carroll has emphasized that the best teams don’t dwell on losses. They regroup and press forward. When they faced Golden State at Barclays Center in November, the Nets fell behind by 28 points but rallied within four in the final quarter before losing by seven. However, the Warriors rested NBA Finals MVP Kevin Durant that night. The task of covering Durant fell to Carroll on Tuesday night. 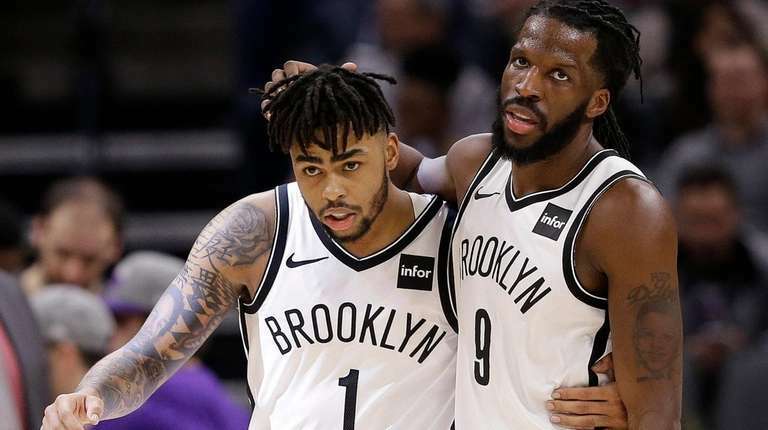 Despite the Nets’ recent struggles, Carroll said there are positives on which to draw, such as the return to the lineup of Rondae Hollis-Jefferson and Caris LeVert, both of whom are playing off the bench and injecting energy and defense. One player who might be pressing is D’Angelo Russell. He returned to the starting lineup the past five games, but he sat out the final 15:58 of the loss to the Clippers on Sunday in Los Angeles. Carroll has developed a strong relationship with the 21-year-old Russell and has provided support all season. “I just told him to stick with it,” Carroll said. “At the end of the day, it’s not about one guy; it’s about team.